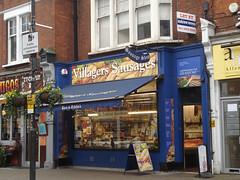 They specialise in sausages, with dozens of varieties available. Examples as of January 2014 include Toulouse-style sausages made with coarsely-ground pork and garlic; pork sausages with chestnut, honey, and mustard; and lamb and duck sausages. They also do vegetarian sausages and burgers, though these are usually only available frozen. As of January 2015 these included spinach and cheddar, red leicester and spring onion, and Moroccan (involving couscous and spices). They're very aware of allergies; none of their meat-based sausages contain milk, many of them are gluten-free, and they have allergy information on a poster on the wall. They also offer knife-sharpening services. Kake took advantage of this in January 2014 and was charged £6 for sharpening of four knives with the offer of a free resharpening if not satisfied with the result. The job was completed within the hour, and very competently too. (The Toulouse sausages bought on the same visit were also tasty.) As of January 2015 the advertised price for knife-sharpening is £2-4 per knife depending on condition. Last visited by Kake, March 2018. Last edited 2018-03-30 09:46:17 (version 5; diff). List all versions. Page last edited 2018-03-30 09:46:17 (version 5).